Energy Returned on Energy Invested (EROI or EROEI) is an expression of energy payback – how much energy we get out of the energy we put into a system. Overall, the safest thing you can say about EROI is that it is controversial and hard to calculate to everyone’s satisfaction, as this article in Scientific American explained last year. Now, a new scientific paper by nuclear researchers in Germany is making the rounds, such as on this popular website among nuclear advocates arguing for nuclear as a way of combating climate change. A version was published by Elsevier and is available behind a paywall. For free, you can access the draft submitted (PDF). Below, my comments apply for both versions. Much of the paper is devoted to explaining how the calculations for EROI were made. The main tweak revolves around the authors’ rejection of a common way of counting renewable energy – with “renewable” always written in quotation marks in the study. The debate is not new; there is an ongoing debate over the distinction between the physical content method (which the IEA uses) and the substitution method (which BP uses). Suffice it to say that each calculation has its justification because each measures something slightly different. Importantly, the share of renewables looks bigger in the physical content method; the paper argues for the substitution method. In general, the authors seem keen on tweaking the calculation in order to make nuclear look better – and renewables worse. In the Wikipedia entry on EROI, to take a relatively neutral source, the EROI of nuclear is around 15, though it ranges from 10-75 depending on the specific type of nuclear technology (there are many). Wind comes in at an EROI of 18; photovoltaics at 6.8. In other words, you get 18 times more energy out of the wind turbine than you put invest in it during manufacturing, installation, operation, and dismantling. Here, “buffered” indicates the energy payback of a technology within a supply system, the assumption being that solar and wind (and apparently hydro) require storage and backup capacity, both of which further reduce the “unbuffered” EROI, which only measures, say, the energy put into and gotten from a solar panel. This is where the argument begins to unravel, for the assumption is untrue. Germany has pumped hydropower storage capacity, but none of it was built for solar or wind. The largest such facility in Germany is in Goldisthal, where construction began in 1997. At present, Germany has 10 percent wind power and seven percent solar, none of which requires storage because the country has never had more than 75 percent renewable power, a record set in August. German researchers have found that the need for storage is not relative to wind + solar anyway, but to the combination of inflexible baseload along with wind + solar. Likewise, France may run its nuclear plants as close to maximum capacity as possible, but it idles a gigantic fleet of backup capacity for much of the year to cover rare peaks in demand specifically because those nuclear plants cannot be ramped up above 63 GW. The paper portrays fossil and nuclear plants as entailing no backup costs, which is clearly untrue. Furthermore, the authors assume that “new and refurbished nuclear plants” have service lives of “even more than 60 years.” As an average, that figure flies in the face of facts. No nuclear plant has ever been in service for 60 years. The oldest one in the world right now is Beznau-1 in Switzerland, which turned an impressive 45 on September 1. While it is true that some nuclear plants have had their service lives extended to 60 years, they will have to make it there first. The oldest nuclear plant in France, Fessenheim, is 42 but scheduled to be decommissioned in 2016. The oldest one in the UK, Wylfa, was off-line for seven months this year and is scheduled to shut down this month, though it could be extended for one more year. Under current commissions, the last of the UK’s 16 nuclear plants but one will retire by 2023, only a year after Germany’s nuclear phaseout is completed. The EU currently has some 130 nuclear plants with an average age of around 30 years. Without having formulated any phaseout policy, the European Union faces a massive nuclear phaseout by the 2030s, with only two nuclear plants currently under construction (in France and Finland) to replace 130. Both are grossly over budget and behind schedule. The market is behind this unannounced nuclear phaseout, with even existing nuclear being considered too expensive to leave in operation. In the US, five nuclear reactors were shut down in 2013 for economic reasons, none of them older than 40. In countries where governments trump markets, such as China, nuclear continues to be built, but in countries like the UK and now Japan the banking sector requires price guarantees above market rates before building a new nuclear power plant. While the service life of nuclear is overstated, wind turbines are expected to run for 20 years, a level commonly reached. They are then dismantled (and largely recycled) to make space for more modern units, not because they don’t work or are a danger to anyone. For PV, 25 years is assumed, the length of warranties – in reality, the panels will work for 35 years or longer, albeit at lower production levels. For tellurium, this was news to me. An NREL study from 2013 (PDF) found that “the current global supply base of tellurium would support <10 GW of annual traditional CdTe PV and manufacturing production” but also found “significant upside potential.” Keep in mind that 10 GW is five times the amount of CdTe PV manufactured in 2013. The market is not yet even asking for the amount of tellurium apparently available. While the researchers’ estimate of wind power’s EROI (16) is not as surprisingly low as solar’s, the paper – which elsewhere complains about “outdated material databases” – uses Enercon’s E-66 turbine in its estimates for wind power (see their chart above). The E-66 was sold from 1995 to 2005; the paper was submitted for publication in 2013. Only the authors know why they used a turbine nearly two decades old. Perhaps the main problem with the paper is its claim that EROI “is the most important parameter.” The energy payback of fossil fuels is only positive as long as we still have sufficient resources. The energy payback of renewables – or as the authors say, “renewables” – is positive even according to their paper, and their claim that an EROI of 7 is required to sustain society completely ignores the biggest source of energy gains: efficiency. As for nuclear, no one is complaining that its energy payback is insufficient. Concerns about nuclear revolve around other issues not addressed in the paper: the risk of accidents during operation and the difficulty of storing nuclear waste safely for tens of thousands of years. In the U.S., the delivered price of nuclear electricity is going to be somewhere around $0.24 per kilowatt-hour, whereas the average tracked efficiency price per kilowatt-hour saved is $0.03. Hence, spending a dollar on nukes will give you 4 kWhe, preempting the 33 kWhe yield that would have happened if you spent that dollar on efficiency. In a sense, to spend a dollar on nukes negates a net 29 kWhe (33 less 4). 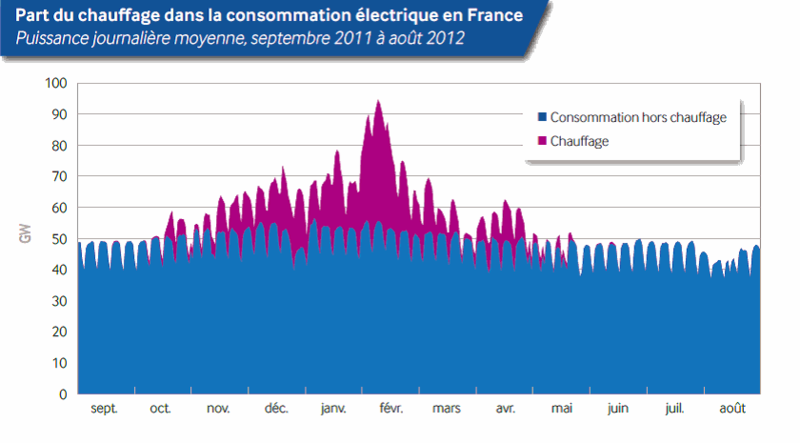 The capacity factor of the French reactor fleet is about 77% due to the load following role of nuclear power in France. The highest capacity factor of reactor fleets running entirely as baseload is about 90% – for example in the US and South Korea. 90% or thereabouts is also the expected capacity factor of new Generation III plants. The EROEI of nuclear power in France will not be greatly affected by this somewhat lower capacity factor – especially as the biggest energy input into nuclear power is in the fuel cycle and not plant construction. ERoEI analysis is mostly crackpot nonsense. Almost all calculations of ERoEI have such severe errors that they are meaningless. 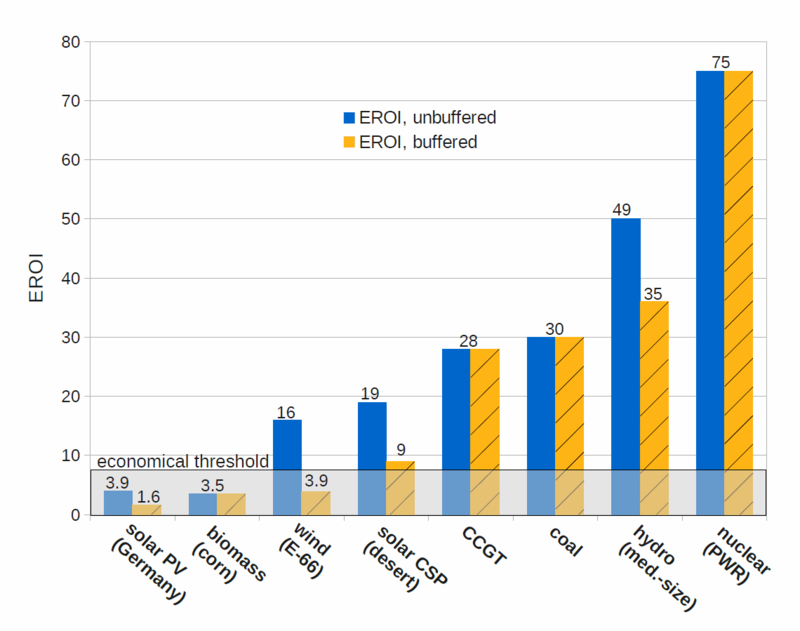 In fact, renewables generally have higher ERoEI than fossil fuels, but it doesn’t matter much, because ERoEI is not important so long as it’s higher than 1. Craig, you make a number of false comparisons and false arguments here. Wikipedia is not neutral on energy; most writers are pro solar and anti nuclear people. All the lower EROEI values for nuclear are based on false assumptions such as assuming gaseous diffusion powered by coal even though there are no such plants in the world, and assuming excessively large uranium mining energy consumptions that are proven wrong by actual data from real mines. Wrong again Craig. Germany is powered by fossil fuels; therefore it does not face the storage problem to the extent mentioned in the article. What we are concerned with here is a post fossil fuel world – where we either use nuclear or use solar and wind with enormous amounts of storage and overbuild. This demonstrates the previous point nicely; you have only 17% wind and solar but already it produces nearly too much at times. That means it is also producing next to nothing at other times to average out so poorly. Solar does nothing in winter when German power demand peaks. This is merely twisting reality!!! If you have reliable power generators you do not need much storage. If you add unreliable solar and wind to the reliable system then it needs more backup. Claiming this as a negative on account of the reliable fossil and nuclear generators is propaganda and a lie. France powers 75% of its country from nuclear, compared to a pathetic 17% wind and solar in Germany. And now I’m being unfair to nuclear, pitting one source against two others of 7% and 10%. France has solved the problem with 75% nuclear and 10% hydro, and only around 10% fossil (no coal power plants) while Germany is the world’s biggest brown coal user (brown coal is the dirtiest type of coal and coal is the dirtiest type of fossil fuel). Germany is not transitioning to renewables, it is fig leaving its dirty fossil fuel kingdom. This is based on actual manufacturer commitment – AP1000 and ESBWR are designed for a 60 year life. Not all reactors are, but most new offerings are. This is different from the past where 30 years or 40 was more common. The extra design life is based on sound engineering principles (such as extra corrosion allowances and materials thicknesses and ease of maintenance and repairs) combined with operating experience far longer than operating experience of PV plants. To the contrary you are being extemely unbalanced here, first claiming that 60 years remains to be demonstrated but accepting 20 year life for turbines at face value. There are almost no wind turbines of 20 years old; the average life is more like 5 to 10 years. This doesn’t mean they won’t last long (most have just been installed recently) but it also means it remains to be actually demonstrated, much like the 60 year nuclear plant life. Both high cost projects are significantly cheaper than wind and solar in Germany, simply looking at the feed in tariff for wind and solar. There are NO commercial panels that have reached 35 years. In fact, there are almost no PV companies that are 25 years old, so it remains to be seen that the warranties are available. PV is a dynamic sector commercially and if companies go bankrupt the warranty is void. A lot of people don’t understand this. If a manufacturer turns out to have panels that only last 15 years we won’t find out for years to come, but when we do, this company will go bankrupt on warranty claims and the other claims will then be void. “For tellurium, this was news to me. An NREL study from 2013 (PDF) found that “the current global supply base of tellurium would support <10 GW of annual traditional CdTe PV and manufacturing production” but also found “significant upside potential.” Keep in mind that 10 GW is five times the amount of CdTe PV manufactured in 2013. The market is not yet even asking for the amount of tellurium apparently available." 10 GWp is only 2 GWe average power, which is a drop in the bucket on the global energy scale. So CdTe is useless. "In countries where governments trump markets, such as China, nuclear continues to be built, but in countries like the UK and now Japan the banking sector requires price guarantees above market rates before building a new nuclear power plant." In Germany, the government trumps the market far more than in other countries. What we see is lots of coal plants continue to operate while solar panels are used as a distraction to that fact. Germany has the biggest market distortions induced by government rules such as feed in tariff legal structures. "Perhaps the main problem with the paper is its claim that EROI “is the most important parameter.” "
It is not the most important, yet it is a critical condition. If EROEI is not enough, everything else is irrelevant. The energy source is fake. You have not even attempted to rebut the main argument about EROEI. In stead you forge some fake arguments that are neither true nor very relevant to the EROEI discussion. Sorry Craig, but its true. So, according to your calculations, Craig Morris, a purely renewable energy infrastructure with storage would be able to maintain an industrialized civilisation? It’s hard to tell because it looks like you didn’t do the calculations. Personally, I have calculated that under current German subsidy conditions, an expansion of renewables without storage to 100% of German primary energy consumption (which is 7 times the electricity consumption) would require us to spend 100% of GDP on the renewables subsidies (and without the subsidies, nobody would install renewables). So, I approached it via the cost not via the EROEI and found a limit. I calculated this in 2013 I think without looking at the EROEI of wind or solar – using cost as a proxy for energy. DirkH, numerous flaws in your assumptions. 1) Don’t count primary energy. You drastically overstate (3x) the need for energy consumption. Count final energy. 2) What prices are you using for renewables? They will drop. And if you are using figures for PV from 2010, you need to cut them in half already. 3) You say that renewables will make up 100 percent of GDP if it covers 100 percent of energy supply. We currently have 1/8 renewable energy, and we spent around 30 billion euros on renewables last year. 8 x 30 = 240 billion. But GDP was around 3,000 billion euros last year, and it will continue to grow. 4) Energy consumption will shrink, not remain constant. Germany has so little pumped hydropower that on the whole it would last mere seconds. The yearly electricity demand is around 500 TWh while the pumped storage capacity is on the order of a couple GWh. 3/4 of domestic and industrial energy consumption isn’t in the form of electricity in the first place, but heat, which means the electricity consumption must go up two-three fold at least if it is to be replaced with solar and wind. Solar and wind power demand storage capacities on the order of months, because there is significant variation in their seasonal and year-to-year output. With the future increase in electricity demand and the need to store energy from one year to the next, the difference between what pumped storage or other buffering capacity exists now, to what is actually needed, is on the order of a million. We need about a million times more. That is to say, in practical terms, we have no buffering capacity. The lower EROEI values given here for nuclear are largely outdated and the more realistic upper figures are well above those of Wind or Solar. One also has to consider very feasible generation-4 reactor designs such as the Dual Fluid Reactor( a molten salt concept), which would have an EROEI far in excess of any energy source we have today, due to the fact mining is reduced by approximately two orders of magnitude, and one also eliminates the energy intensive fuel cycle which typically counts for the majority of invested energy in nuclear energy. Kindly help me find good relevant articles to assess the EROI of pumped hydro energy storage system.The information on websites are insufficient and lack a lot information. You do not seem to be aware that solar panels have been commercially produced and used since the nineteen sixties, in space and on earth for stand-alone off grid applications. Hence there is plenty experience with panels lasting much longer than the expected 20 years. You might try to wriggle out of it by stating that this is not a commercial system. Which is true, but the panels themselves were produced commercially by AEG-Telefunken. The solar PV part of that company changed hands and name a few times, but it still exists. Some counter examples, most of the famous Vestas windturbines of Alamonta pass worked for over 30 years, the Netherlands are still many Lagerwey windturbines from the 1980s happily producing electricity. Near to where I live there are Enercon windturbines from the early nineties still doing their work. A bit unclear what you mean here. If you mean “age” that is to be expected, with exponentially growing installation numbers most wind turbines will of course be young. That says nothing about their endurance. When you mean “life-time” you are probably confused by repowering. In countries with a mature windpower development older smaller wind turbines are often replaced by bigger windturbines to make better use of the local resource. This does not mean the old ones are scrapped. There is a lively trade in second hand wind turbines, and many windturbines from the eighties and nineties in Europe are now spinning in development countries. Strange for the renewable power sources you sweep the design lifetime of the table, and ignore real life examples of installations lasting much longer than the designlifetime, but for nuclear you believe the blue eyes of the manufacturers. Smells like double standard to me. This is plain false. Breeder reactors will use that waste so that it will become low radioactive. Next PostIt’s the costs, stupid. Therefore, opt for renewables!